The wait, enthusiasts, is over. We watched helplessly as Ford’s European division launched the first Focus RS in 2002 and greedily kept it to themselves. Again, we were spurned with the launch of the European-only second generation Focus RS in 2009. Ford’s return to a single, all-new Focus platform in 2011 brought hope for performance-oriented Focus ST and RS variants in North America. That first step was achieved in 2012 with the North American debut of an all-new Focus ST. 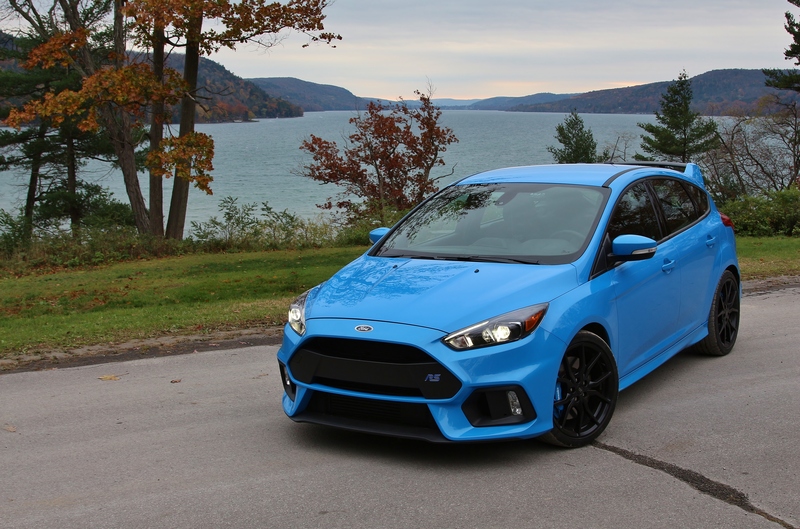 Finally, at the 2015 New York International Auto Show, Ford debuted the third generation Focus RS. This time, we’re allowed to partake. Will it be worth the wait? The news only continued to get better. The 2.3-liter EcoBoost engine originally estimated to make around 315 horsepower and 320 lb-ft torque was actually going to produce 350 horsepower and 350 lb-ft torque! A six-speed manual would be the only transmission available and, for the first time ever on a Focus, power would go to all four wheels with a torque-vectoring all-wheel drive system. Finally, that new system would have a special Drift Mode allowing for extra slip angle before traction control kicked in. To fans of the Blue Oval, this was music to their ears. Climbing into the new RS, only the blue contrast stitching and smattering of RS logos will clue you into the uniqueness of this new Focus. There’s no escaping the budget-minded interior components from the standard Focus that remain in this $40k example. Outside, however, is a different story altogether. 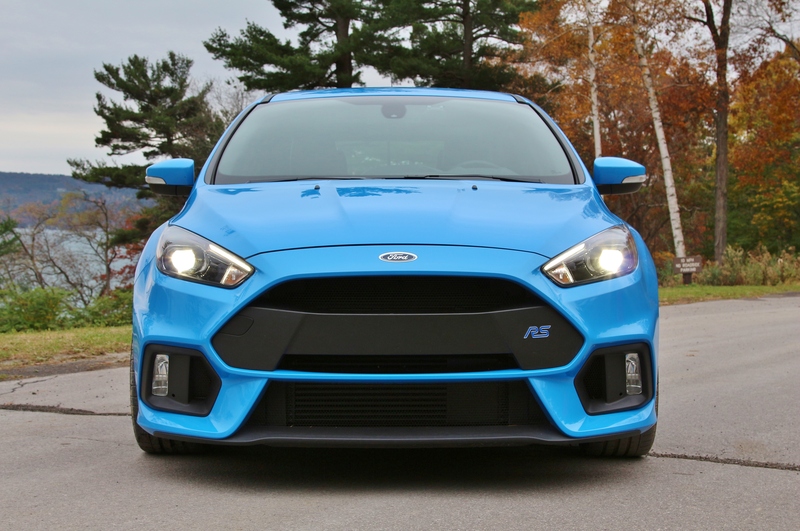 The RS’s unique body kit includes an entirely redesigned front fascia for more airflow. Around back, a rear roof spoiler sits high over the roofline, far more prominently than the ST. The rear diffuser is also unique with two large sections carved out for the RS’s girthy dual split exhaust. Our tester also was equipped with the optional 19” wheels shod in ultra-high performance Michelin Pilot Sport Cup 2 tires. There’s no doubt that this is the most aggressive-looking Focus to date. To stand out from the crowd even more, option the RS-only highly-metallic Nitrous Blue paint. The extra cost is well worth it. An all-wheel-drive hot hatchback is the ideal all-year car and the conditions we experienced undoubtedly support that conclusion. 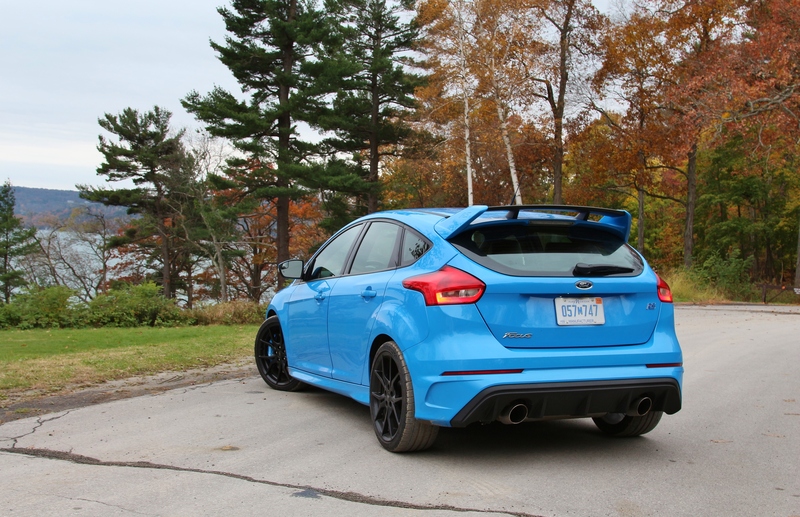 Our late October week with the Focus RS ranged from an unseasonably high 84 to an unseasonably snowy 32. 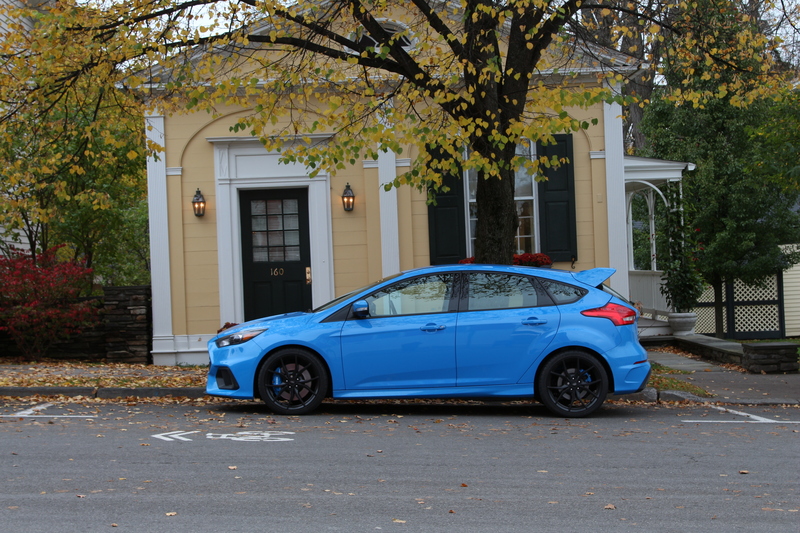 Surprisingly, even on the Sport Cup 2 tires, the Focus RS’ character remains unchanged. The warm-weather grip of the tires predictably gave way to the cold-weather intelligence of the new all-wheel-drive system. On warm, dry roads the grip is astonishing; it’s virtually impossible to unsettle the car even with traction control disabled. On snow-covered roads, the RS acted as if it was already shod in all-season tires. In a snowy parking lot, the new Drift Mode makes for some impressive antics. The RS finally answers the question as to why the Fiesta ST and Focus ST’s Recaro seats are so heavily bolstered. From a standing start, there’s noticeable turbo lag. It’s not a car that feels quick off the line or in a straight line even though 60 mph arrives in 4.7 seconds. Keep the turbo spooled and you’re rewarded with readily available power and a blend of intake and exhaust rumble. Shift abruptly while the engine is under full boost and the RS emits a satisfying pop or two from the exhaust, rally car style. Speaking of shifting, whereas the ST’s clutch lacked a clear engagement point, the RS is much more straightforward. There’s a sense that this car is eager to be driven hard and put away wet, the kind of car where every run to the shop is a rally special stage. And even after spending nearly 600 miles pretending to be Tanner Foust, the RS still managed to return 19.8mpg. The RS’s advantages are much more noticeable in corners and under braking. 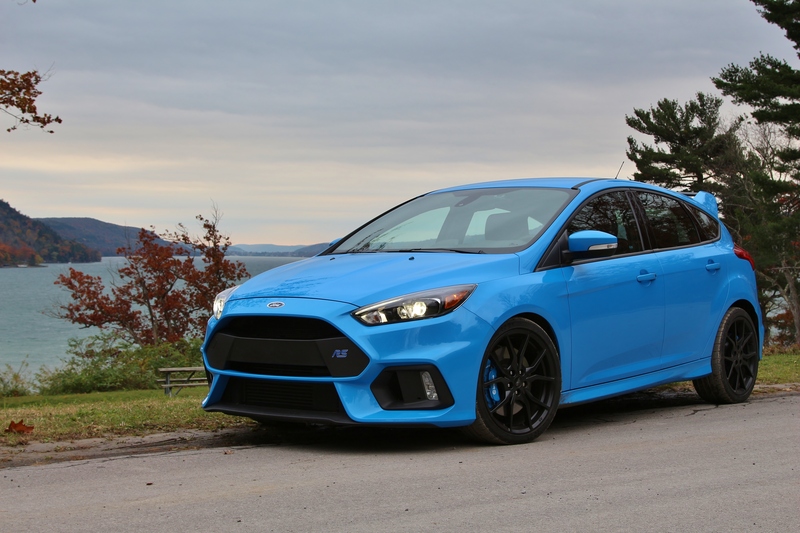 The Focus RS has a completely revised suspension system that includes electronically controlled dampers. Under normal operation, the RS ride is firm. Activate the Sport damper setting by toggling the Drive Mode to Track or by pressing button on the left column stalk and you can count every expansion joint on the highway. The RS is much stiffer than the ST, and rightly so, but the Sport damper setting is probably best left for timed events only. Even without it, body roll is so easily kept in check that you’ll just barely need to brush the brakes to keep weight on the nose of the car into the corner. When it does come time to stop, the blue Brembo brakes offer phenomenal bite and great pedal feel. The plucky hatchback packs more charisma than the sterile Volkswagen Golf R and more practicality than the sedan-only Subaru WRX STi. The only thing it can’t escape is its budget-minded origins. Both the Golf R and STi come from similarly humble models but manage to have more refined interiors. Despite this, the supercar levels of grip and rallycross good looks make the RS is one potent package. One that was worth the wait. It’s really cool! And I love the interior lights color to match the body color. And the front fascia is awesome!